How can you help kids with autism be flexible, get organized, and work toward goals – not just in school but in everyday life? It’s all about executive function. This week, we’re offering 15% off* our newest books on teaching executive function: Unstuck & On Target: An Executive Function Curriculum and Solving Executive Function Challenges. Just use our promo code EXECFXN at check out to redeem these savings! These practical resources for parents, teachers, and therapists help high-functioning students with autism improve on these critical skills. Unstuck & On Target! is a robust classroom-based curriculum book that will help educators and service providers teach these executive function skills to high-functioning students with autism through ready-to-use lessons that promote cognitive and behavioral flexibility. This curriculum gives clear instructions, materials lists, modifications for each lesson, and intervention tips to reinforce lessons throughout the school day. Topics touched upon include flexibility vocabulary, coping strategies, setting goals, and flexibility in friendship, all introduced and reinforced with evidence-based lessons. Lessons will target specific skills, free up the instructor’s time, fit easily into any curriculum, ensure generalization to strengthen home-school connection, and best of all, make learning fun and engaging for students in the classroom. Unstuck & On Target! also comes with an accompanying CD-ROM that contains printable game cards, student worksheets, and other materials for each lesson. The curriculum is targeted for students with cognitive ability and language skills ages 8-11. 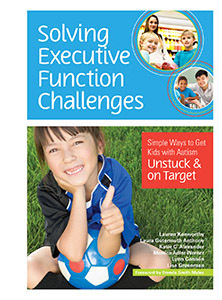 Solving Executive Function Challenges is a strategy guide that offers teachers and caretakers various ways to teach EF skills, including setting and achieving goals and being flexible, as well as ideas for accommodations and actions to address common problems (e.g. keeping positive, avoiding overload, coping, etc.). 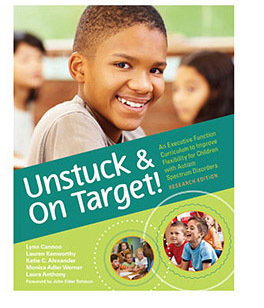 To be used with or without the robust curriculum Unstuck and On Target!, this strategy guide aims to show how to embed executive function instruction in everyday scenarios with specific examples, samples IEP goals, and scripts and worksheets that break down tasks into manageable chunks. This guide is appropriate for learners in grades K–8. Don’t forget – you can save 15%* this week only on these new executive function books by applying promo code EXECFXN at check out! *Offer is valid until 11:59pm EDT on October 7th, 2014. Not compatible with any other offers. Be sure there are no spaces or dashes in your code at check out! Written by: Different Roads to Learning on September 30, 2014. This entry was posted in ABA, Academics, Applied Behavior Analysis, autism, autistic spectrum disorder, Behavior, Daily Living Skills, Pick of the Week, Products, Resources, Sale and tagged ABA, Applied Behavior Analysis, autism, autism education, autistic spectrum disorder, curriculum books, developmental delays, developmental disabilities, executive function, Lauren Kenworthy, learning, Lynn Cannon, Resources, Solving Executive Function Challenges, special education, teaching tools, Unstuck & On Target by Different Roads to Learning. Bookmark the permalink.